The Newtown Creek Armada was a public art installation exploring the past, present and future of the Newtown Creek, a Superfund site bordering Brooklyn and Queens which is one of the most contaminated waterways in the United States. 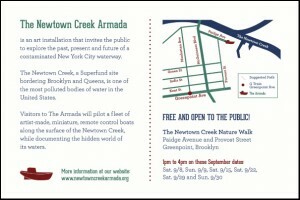 Visitors to The Armada piloted a fleet of artist-made, miniature, remote-controlled boats along the surface of the Newtown Creek while documenting the hidden world of its waters using waterproof cameras and microphones. 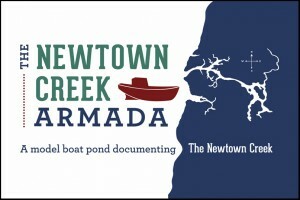 The Newtown Creek Armada was created in partnership with the North Brooklyn Public Art Coalition and with the support of the North Brooklyn Boat Club and the New York Department of Environmental Protection (DEP). It has received grants from the Hudson River Foundation, Brooklyn Arts Council, FEAST Brooklyn, IOBY, and Macktez.